It’s no secret we love greens, and with Summer coming in hot, they are pretty much all around. Blooms are budding, birds are chirping, and growth is happening. But even though we love greenery, we are the first to admit that keeping plants happy can be a full-time job. How much water is too much water? Where will they get the sunlight they need? What should the soil look like? It’s all too easy to squander your hopes and dreams for a seed with the slightest touch from a black thumb. So, in an effort to find a plant that has a little bit of chill and a lot of growth potential, we consulted with our friends at The ZEN Succulent. The ZEN Succulent is a modern terrarium and plant craft business with a cozy shop in downtown Durham, created and run by the mother/daughter team of Margaret and Megan George. The shop’s items combine their soil with locally sourced plants and terrarium elements from harvesters and fabricators in the Philippines, Japan, and throughout North America. ZEN Succulent’s dynamic duo have clued us in to an alternative to buds that are more temperamental – air plants. Air plants grow on top of surfaces rather than in the ground, and while there are many species that exist under this umbrella, one of the most typical is in the genus Tillandsia. In comparison with a lot of other plant options, these are relatively easy to keep alive. - Plenty of bright, indirect light! Ideally, these would be hanging in your North or West facing windows for just the right amount of sunshine. - Watering every once in a while! Air plants don’t need to be watered daily, and can survive happily off of a mist once or twice a week. Too much water can cause them trouble, so avoid being too heavy-handed. This step is not a “must,” but will leave your air plant looking vibrant and encourage it to bloom. Air plant food is easy to find (our friends at the ZEN Succulent carry it), and comes in the form of a fertilizer you spritz them with, preferably on a monthly basis. Awesome Humans is a series highlighting those around us who make our communities better, our dreams bigger, and our happiness greater. Kathy Smith is the founder of Yoga Off East, Happy + Hale Durham’ s sister studio. 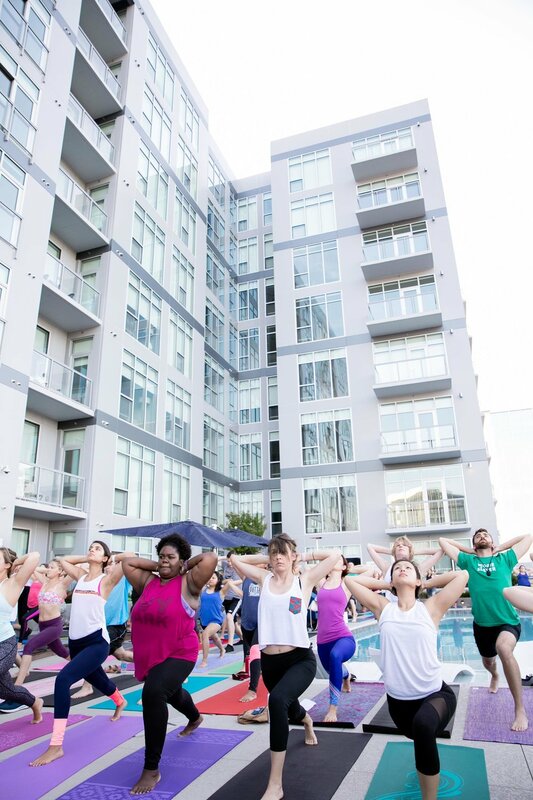 Yoga Off East is first and foremost a neighborhood yoga studio, offering vinyasa-inspired yoga classes 7-days a week. My career path has always been rooted in athletics – years before owning Yoga Off East, I was a college tennis coach. My husband’s job as the coach of the Duke’s men’s tennis team brought me to Durham. My experience with yoga up to that point had always been as a competitive athlete or coach. Yoga taught me to stay out of my own way by having more awareness of the myriad of thoughts going through my mind on the tennis court, and eventually that translated into almost every aspect of life. Moving to NC gave me time to dive into yoga for myself for the first time as a top priority. Even though I wasn’t a yoga teacher at the time, I had a crazy vision to open a studio near campus and serve the Duke community through yoga. 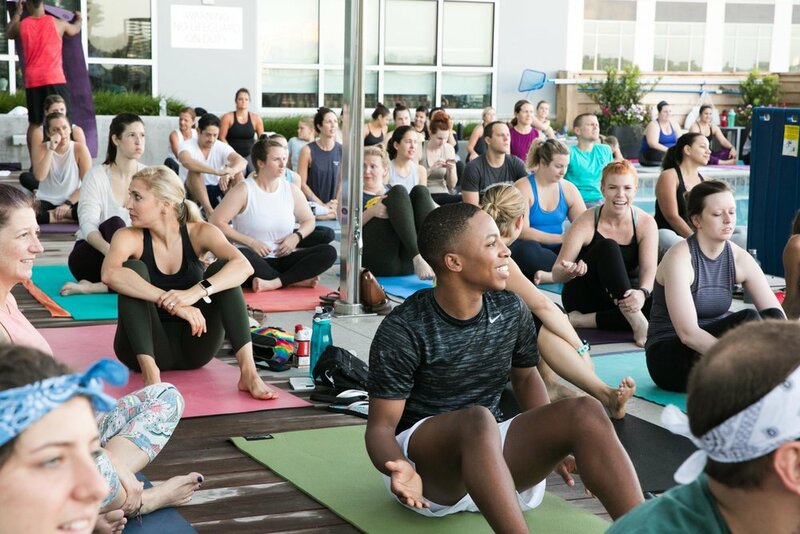 One thing led to another: I got certified as a yoga teacher, built relationships in the wellness community, and Yoga Off East became a reality after a mentor and fellow yoga teacher introduced me to Happy + Hale. 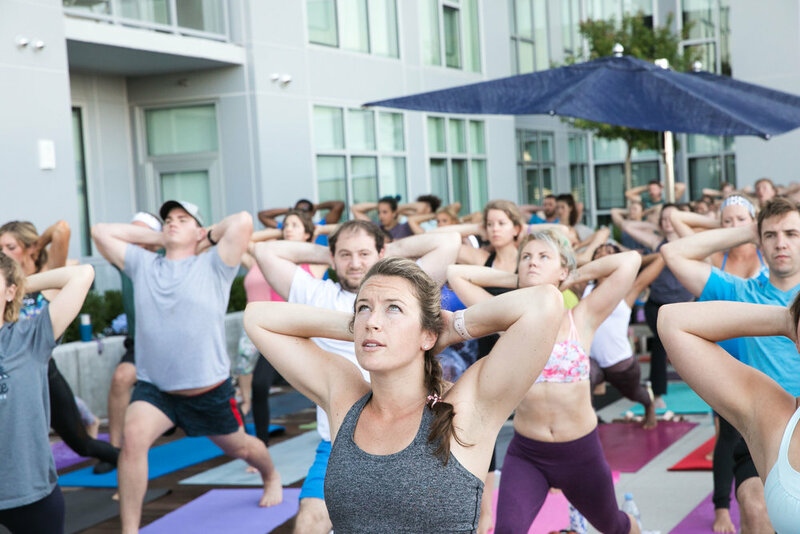 My vision from the start was to create a sanctuary in the bustling area of Ninth Street where our neighbors and community-at-large can come to reset and build a ritual of yoga into their weekly routine. I’d love for Yoga Off East to be in the service of supporting our teachers and our students to be clear that they have a special gift to share, and for the practice of yoga to be a support in the sharing of those gifts in the world. A pro tennis player when I was little, then a veterinarian, then a magazine editor/writer. Truthfully, though, I have always been drawn to the idea of being a small business owner. If you had theme music, what would it be? Typical yoga flow stuff. Probably something electronic downtempo, pop, or alternative. My own practice of yoga keeps me inspired, especially meditation and challenging vinyasa classes. I am also inspired by reading and writing. If all else fails, I recharge by taking my dog, Sage, on a walk alone. My family – my husband, two kids, and our dog…and beyond that my extended family including 4 nephews and 11 nieces! What does the local community mean to you? 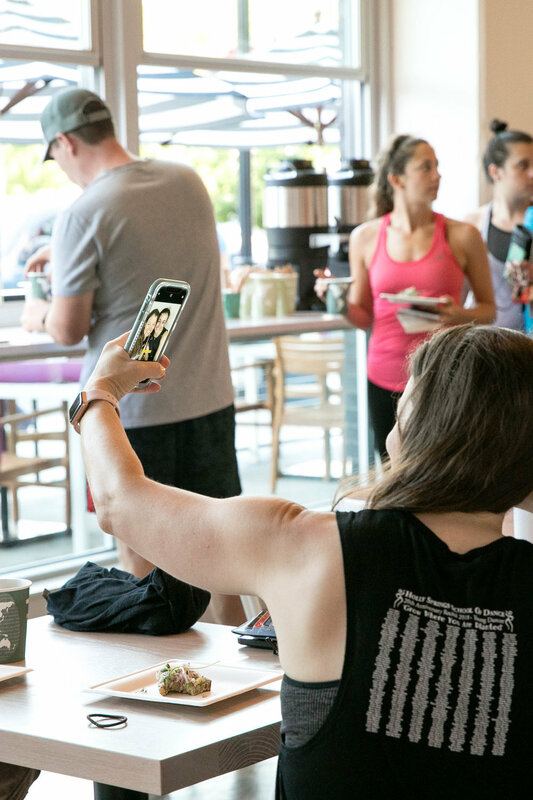 Yoga is evolving, and so is my relationship with the local community. If I didn’t feel a deep connection to Durham, Yoga Off East would not exist. This is the city where we live, work, and now are raising children, and it’s important to me to share a space with the community where I can be a stand for others to show up and be their best self. My why is because the world is wonderful and I believe we should rise up to it, be well, and do good. We get asked constantly where our juice pulp goes. Back to the Earth, of course! Not only do we compost our juice pulp, but ALL of our food scraps as well as our post-consumer wares (bowls, plates, cups, lids, straws, napkins, etc). Is it expensive? Yup. Is it a lot of work? Absolutely. Is it worth it? You bet! Leafy green pulp from our cold pressed juice extraction process. To the farm! It is first important to note that we are dealing with two types of compost: Pre-consumer and post-consumer. Each and every week our restaurants create hundreds of pounds of food waste. Between dense juice pulp and assorted food scraps (think banana peels, egg shells, red pepper stems, coffee grounds, onion peels, dino kale stems) we are constantly filling up buckets of rich, organic matter that many will haul straight to the dumpster. Not us! From here Lester will be by to scoop up our buckets and take to the community garden at Passage Home in Downtown Raleigh. This is where things get messy, and fun. Food scraps. It all starts here. Bowls, lids, cups, straws, straw wrappers, forks, spoons, knives...all of it...we compost it all! All of our post-consumer wares are plant-based and come from Eco Products. After you're done enjoying that quinoa bowl or Almond Brothers smoothie, drop your "trash" into one of our compost receptacles. The crew at Compost Now will be by soon to transport to a commercial facility. There, your wares will begin to break down until fully degraded into the soil, typically a four month process. Magic! The lone crane watches over the pool deck.